I’m a big fan of going local when buying solar. There are almost five thousand qualified solar installers in Australia, so no matter where you live, there is likely to be at least one close to you. With any luck, there will be at least three, so you can do the sensible thing and get three quotes to compare. Go to the official Clean Energy Council ‘find an installer’ page: solarquotes.com.au/findcec. Click on ‘search by location’ and enter your suburb. The map will refresh with a red pin for every local electrician who is qualified to install solar power. Click on a pin for the details. It will give their individual name, company name (unless they are a sole trader) and phone number. This is a great way to find your nearest solar-qualified electrician. The only problem is determining how good they are at solar installs and the quality of the hardware they choose to use. If you put the electrician’s name and ‘solar’ into Google, you may find some reviews that will give you an indication of their quality. I’d also recommend searching for their name on my site (solarquotes.com.au), which has over 25,000 reviews of solar installers. 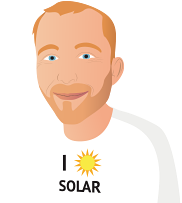 If you luck out and find three local electricians who install solar themselves or work for a well-reviewed solar installation company, I recommend that you ask those three to provide quotes for the system size you need. Using solar quoting services or brokers. These days, if you go online and put ‘quotes for solar’ into Google, the results will be dominated by companies offering to get you quotes from multiple companies for free. These websites have a client base of solar installation companies around the country. When you fill in a form on the website to ask for quotes, they refer you to several companies and charge each company a referral fee. Some also take a commission from the solar companies if you choose to go with one of them. I own and operate one such company: it’s called SolarQuotes®. Since 2009, over 1 in 30 homes in Australia has used it to get quotes. Over the last few years, lots of copycat sites have sprung up, but from what I can see (and, yes, I am biased), most of them fail in one big way: they don’t vet the solar companies that they recommend very well. Many of these sites have clients that have been fined or reprimanded by the ACCC for false claims or fake reviews, so be careful. There are only two solar quoting websites that I would recommend. Mine: SolarQuotes® (solarquotes.com.au) and Solar Choice (solarchoice.net.au). The main difference between the two sites is that SolarQuotes® hosts tens of thousands of reviews of almost every solar company in Australia and is mostly focused on residential solar, whereas Solar Choice does not host customer reviews, and, in my opinion, is a better choice for large, commercial solar projects. The other thing you should know is that SolarQuotes® only charges a referral fee (about $40 per referral) to the company. Last time I checked, Solar Choice charges a referral fee plus a commission on any sale made to you. SolarQuotes® and Solar Choice both vet their installers carefully, so using their services is a low-risk way to quickly get up to three quotes from reputable solar companies. I would recommend using either one or the other. If you use both, you’re likely to get six quotes, which can become overwhelming for everyone involved. Finally, here are some common mistakes to avoid. Don’t get quotes from unsolicited callers or door-knockers. In my experience, companies that use these tactics almost always either charge expensive prices or use junk hardware. Or both. Don’t be tempted to buy second-hand solar equipment. I’m a big fan of second-hand cars, bikes and furniture, but not solar power components. I won’t go into the reasons why here, but you can read about the specific problems on my blog: solarquotes.com.au/secondhand. Don’t buy solar on eBay or Gumtree. Buying any solar equipment – apart from little camping panels – on eBay, Gumtree or similar sites is fraught with danger. If the panels are sent from overseas, they’re unlikely to meet the strict Australian electrical safety standards and it’s likely to be illegal to connect them to the grid. You’re also unlikely to save any money, because you can’t claim the rebate on unapproved equipment. Don’t look for the absolute cheapest system on the market. If a solar price seems too good to be true… well, you know how it goes. I talk about the specific dangers of the cheapest solar power systems on the market on my blog – just in case my earlier rants didn’t convince you: solarquotes.com.au/cheap.